0 | 13 students enrolled. 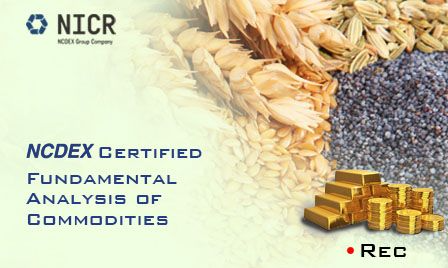 The “NCDEX Certified Fundamental Analysis of Commodities” online course will build your understanding of fundamental analysis of commodity market. This course gives you detailed idea of the process of fundamental analysis of various commodities. You will be introduced to the concept of fundamental analysis and build your knowledge on various methodologies used for that. Students enrolling for the “NCDEX Certified Fundamental Analysis of Commodities” will be given a “Certificate of Participation” from NCDEX facilitated by Elearnmarkets, after successful completion of the course. He shall also be given free access to related webinars conducted by Elearnmarkets for further knowledge enhancement. Email query support, Question & Answer community platform will also be availed by the student for any kind of doubt clearance related to content while pursuing the course. All the knowledge content is provided by Elearnmarkets.